Corey Voss & Madison Street Worship has released “Songs Of The House” through Integrity Music and all songs are now loaded into WorshipTeam.com “Songs Of The House” is a live recording of some great new songs. Songs Of The House delivers just that: new worship songs that reflect the revival happening at Gateway Shelbyville, a multi-generational, multi-cultural Tennessee congregation situated on the small town’s main thoroughfare of Madison Street. Combining themes of belonging, family, healing and freedom in Christ, Songs Of The House follows Songs Of Heaven & Earth. For the 10-track Songs Of The House, listeners will hear not only Voss and team, but the congregation singing along as well with raw energy and joy. Perhaps it is because these are their songs birthed from and for the local church. It is a natural outflow of the songwriting culture developed by Voss and Gateway’s pastor, Jason Daughdrill. In every track, listeners will hear a church reawakened and on fire. Only seven years ago, Gateway Shelbyville was struggling along with less than 60 people when Daughdrill stepped in as pastor. Shortly after, Voss joined the church and soon others began finding their way to what has become a booming community of over 1,000 members in rural, middle Tennessee. 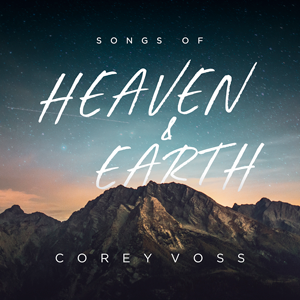 Corey Voss has released “Songs Of Heaven And Earth” through Integrity Music and all songs are now loaded into WorshipTeam.com “Songs Of Heaven And Earth” is a recording of some great new songs. The album, Voss’ full-length debut, explores the transformative power of praise, celebrating the Creator with lyrical imagery drawn from scripture and inspired by His creation. Songs Of Heaven & Earth follows the critically acclaimed Songs of Heaven & Earth digital EP from Voss, the writer behind Selah’s radio hit “I Got Saved.” Voss includes “I Got Saved” and another favorite, “Praise The King,” on Songs Of Heaven & Earth while his voice also showcases the work of other noteworthy writers and collaborators. This includes the church-ready, Dove Award nominated “God Who Moves The Mountains” from Dustin Smith, Richie Fike and David Leonard (All Sons & Daughters) and “As It Is In Heaven” penned by Voss’ label mates Alisa Turner and Michael Farren who guest on the song. In addition, Dove Award winning writers Krissy Nordhoff and Jennie Lee Riddle, country artist Crystal Yates, newcomer Rhyan Shirley and Voss’ producer, Kyle Lee (Leeland, Bryan & Katie Torwalt) co-author songs. 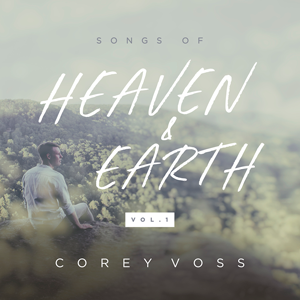 Corey Voss has released “Songs Of Heaven & Earth” through Integrity Music and all songs are now loaded into WorshipTeam.com “Songs Of Heaven & Earth” is a live recording of some great new songs. For Songs Of Heaven & Earth, Voss recorded at his home church with producer Kyle Lee (Aaron Shust, Bryan & Katie Torwalt). In addition to “Canyons,” which Voss co-wrote with Dove Award winner Krissy Nordhoff (“Your Great Name”), the project includes “Don’t Ever Let Me Go” a co-write with Dove Award winner Jennie Lee Riddle (“Revelation Song”), and “The King Is Here” a co-write with Rhyan Shirley. The EP is rounded out with songs from fellow Integrity writers: “As It Is In Heaven,” penned by Alisa Turner and Dove Award winner Michael Farren, and “God Who Moves The Mountains,” penned by Dustin Smith, Richie Fike and David Leonard (All Sons & Daughters).